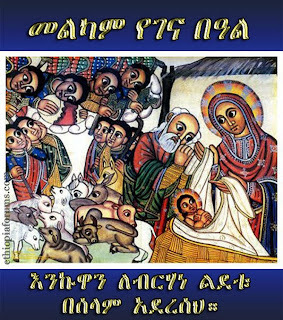 ደጀ ሰላም Deje Selam: ቤዛ ኩሉ ዓለም ዮም ተወልደ:- Happy Ethiopian Christmas!!! The Following article is taken from Mahibere Kidusan Website. Thank you so much DS for this valuable message. And thanks to Mahibere Kidusan too. I am very happy and proud of being the follower of this true religion. TRUE ORTHODOX TEWAHEDO. Shame on those ppl (such as tesfa, ewinet, mesfin...) who have never been yielding to write and say ABSOLUTELY FALSE accusations to Mahibere Kidusan and tried to spread their heretic (MENAFIK) messages to this media. It has been long since we know who you are bcs of your 'fruits'. I wish you all (and for them too) a happy holiday. May God bless us all in this holiday season and bring those who are out of the only TRUE way to their ethernal home !!! Thank you DS for the wish! I couldn't get why you said "Ethiopian (African) Christmas". Can somebody explain that? I am confused too. What does Ethiopian/African mean? Does that mean the Ethiopian Christmas is African Christmas? They don't celebrate it. So, they don't think of it. And they don't believe in it. They believe the European Christmas. But, DS says the Ethiopian Christmas is the African Christmas. Is that because Ethiopia is found in Africa? Or because Ethiopians are predominantly dark-skinned? አሜን፡ ቃለ ህይወት ያሰማለን ደጀ ሰላም! እንኳን አብሮ አደረሰን ወገኖቾ፡ የሰላም ደጆች! ደስ ይበላችሁ፡ ደስ ይበለን! The one and only true African nation that remained truly African is Ethiopia. That's why the Ethiopian nation has so many challenges and temptations. Merry Genna! At least five Coptic Christians have been killed in a drive-by shooting outside a church in southern Egypt, officials say. The shooting came as worshippers left the church in Naj Hammadi after a midnight mass on Coptic Christmas Eve. ..
Best Wiches to all those celebrating the new bornborn Child, the King Nativity January 7th. is only Ethiopia celebrat Christmas on January 7th? let us greet our brothers and sisters in Christ too. You probably wonder why do Russians Orthodox people celebrate Christmas on January 7th? Why not on December 25th? Well, the reason is that the Russian Orthodox Church still lives according to the old Julian Calendar, which is currently 13 days behind the Gregorian Calendar, which is adopted by most countries in the world (and by the Russian government). When in the end of 1917 the Bolshevik government decided to adopt Gregorian calendar, the Russian Orthodox church decided not to follow the rules set by the incresingly oppresive civil authorities. Part of the reason was to protest against the Bolsheviks and their interference in church affairs. Another reason, perhaps, was to stick to the older rules, the ways in which generations of Russian Christians were praising the Lord, observing holidays, etc. It has to be said that Russia has been Christian since the year 980 A.D. (for over 1000 years) and traditions mean very much for every Russian Orthodox Christian. Nowadays, the Russian Orthodox still follows the old calendar and all Russian Orthodox believers celebrate Christmas on January 7th. For the not-so-religious part of the society Christmas time is just a long holiday season. Many people start celebrating Christmas on December 25 (together with the Western World), then continue to observe New Year Eve with festive parties, enjoy New Year Day with their families and, finally, celebrate Russian Orthodox Christmas on January 7.
great! let Love one another. Christmas is an opportunity to revive our faith in the One who was incarnate of the Holy Spirit and the Virgin Mary. Jesus was born of a virgin to save the world from sin and to lead it towards salvation. God, in the Christmas message, sent His only Son to show us that human nature is neither evil nor transient. For, as God took on human nature, that nature has become noble, and we humans, the carriers of His image, became thereby noble, and touched by the holiness that comes from above. Christmas means God came to us and for us. Accordingly, we should be ready to do God's will. On this day we beseech the Almighty to open our eyes to see our brethren, and appreciate that the God who created us is the God who created them; they have the right to exist as we do. Otherwise, our faith will be at fault. At Christmas we look at our world and ask God to have mercy on us and grant us His Grace. There are people who are dying here and there; there are millions who are displaced. May the Good Lord give them solace and peace. I pray to the Child born in a cave in Bethlehem to forgive our sins and look upon you and upon us with His infInite love and boundless mercy. Thank You! very nice msg. I am praying fot the unity of the faith. so that Togather we can do better. we just need to commend ourselves and each other, and all our life unto Christ our God. with hlove in Christ the King. GOD become human to forgive us all. HE was born to show us love so that we love each other.ARE WE ALL DOING THIS? The mistry of God become human is the same as that of His second coming for judgement.GOD become human to see the sick.Adam was sick because of sin. HE was born to dress up the destitute Adam whose grace of God was taken away.God was born to feed hungry Adam who was hungry of food that gives eternal life.He become human to free incarcerated Adam who was under the custody of satan.He was born to satisfy thirsty of Adam who was thirsty of Word of GOD. And when the Almighty God comes again He will ask us if we visit the sick,feed the hungry,visit those in jail,help the impoverished and satisfy the thirsty. Are we all doing these? May GOD enlighten our hearts. PLS SEE THE BLOG "ANDIT BETEKIRSTIAN" YOU WILL BE EXITED ON THE ACTION OF HOLY TRINITY CHURCH OF LA.